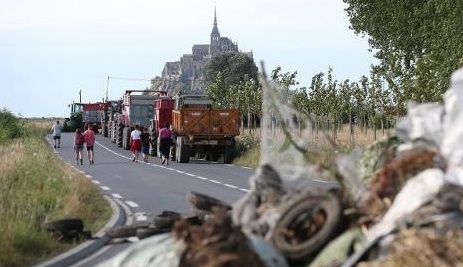 Today (Tuesday) tractors continue to block off the roads to Mont-Saint-Michel; France’s second most-visited tourist attraction. The blockade began on Sunday evening with farmers across Normandy blocking the roads in the town of Caen. 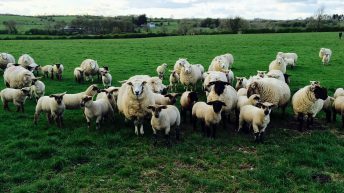 The French Minister for Agriculture, Stephane Le Foll, has said that there is an agricultural crisis in the beef, pork and dairy sectors in France. Since the start of the year, he said that figures collected by his department show that some 23,000 French farmers are on the verge of bankruptcy. Le Foll said that the crisis is primarily for milk, a global crisis related to the butter market, the milk powder at the end of quotas and contraction of larger markets, especially China. In the pork sector, he said that it is necessary to value French meat and contractualise trade agreements between farmers, slaughterers and processors. For beef, he said it is a national problem, that French beef consumption is changing. The Russian embargo and competition from other EU countries are other reasons for the low producer prices. 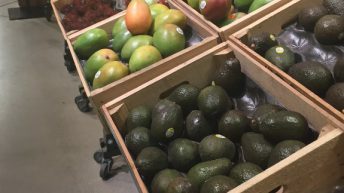 Price wars between supermarkets are also pushing down farmers’ incomes.